Gift some Michigan Brut and Michigan Harvest: New this year, and our first ciders in 12-ounce bottles, Michigan Brut and Michigan Harvest offer a great choice for cider connoisseur and cider novice alike. Michigan Brut is a dry, crisp, and refreshing cider that is aged in French oak barrels. Michigan Harvest is a semi-dry cider that is equally crisp and finished with juice from freshly pressed apples from this year's harvest, adding a touch of subtle sweetness to the cider. 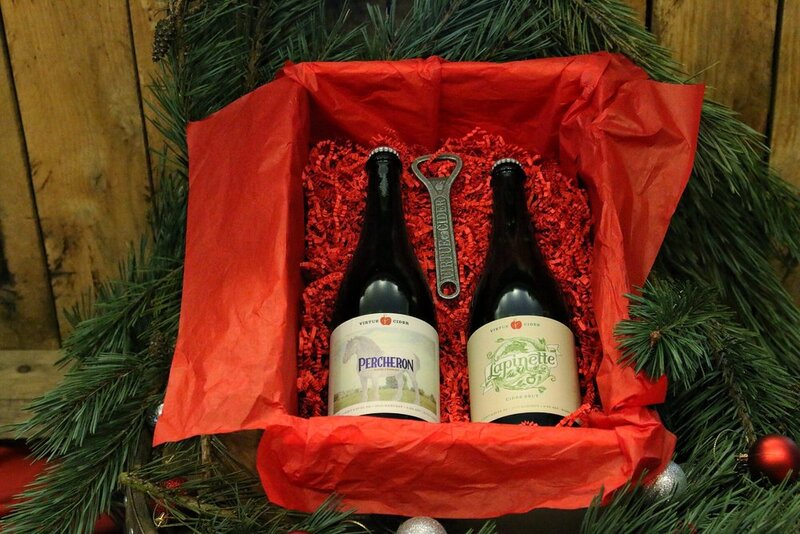 Grab one or the other, or give a 4-pack of each for a seasonal red and green gift! Get dressed in Virtue Cider gear. 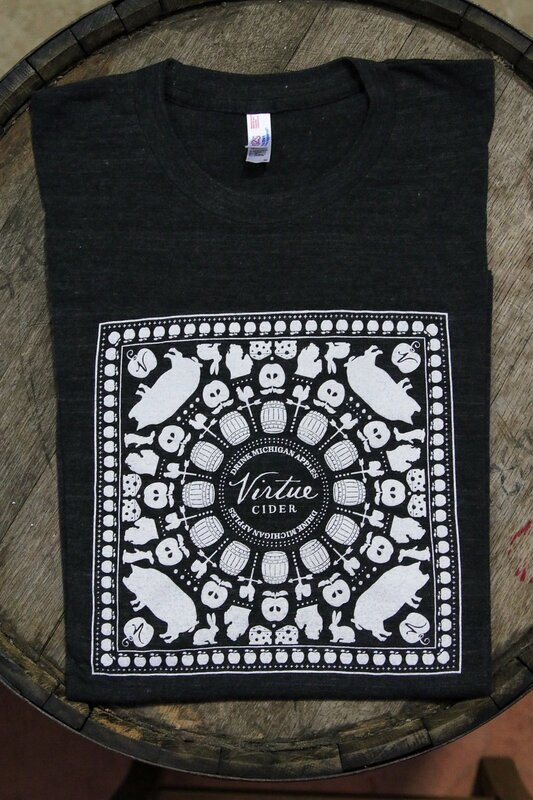 A must for any Virtue Cider fan, we have a wide selection of wearables and accessories that make a great gift and are easier to ship than cider. Choose from our knit hats, zip-up jackets, t-shirts, bottle openers, pins, stickers, and more. All Virtue Cider merchandise is available for sale at our Bottle Shop in Fennville, Michigan, and a selection of items are available at our online store here. Build a Virtue Gift Box (Bottle Shop only). Not sure what to choose? Come visit our Bottle Shop at Virtue Farm, and we can build a gift box for you! Choose from any of our cider products including Bottle Shop exclusives such as Fennville Cidermaker Blend or Cherry Mitten. You can mix and match anything you like — even our curated selection of locally made snacks or our merchandise. Party While You Shop: This Saturday, Dec. 17, we're throwing an Ugly Sweater Party at Virtue Farm. (Don't worry, it's all indoors.) Join us in our Bottle Shop and Tasting Room from noon-7pm for holiday tunes, seasonal snacks, shopping, and of course lots of cider. We're even making mulled cider. Don't forget to don your favorite ugly holiday sweater — we just may have a special treat if you're looking seasonal!